Saturday, August 19th is a day of commemoration and celebration. The Cobblestone Society and friends are gathering at the former Gaines District #5 Cobblestone School to celebrate the enduring legacy of Honorable William Jenks Babbitt by ringing the school bell he gave to the school in 1849. Many years silent, the bell will now ring once again to remind all who will hear it of the remarkable legacy of a true Orlean’s pioneer. Babbitt arrived in “Genesee Country” in 1810, and following the War of 1812, he moved his family to what would become Gaines. He became the area’s first blacksmith, established the first brickyard in Gaines, supplying the brick for most area buildings. Babbitt was appointed Justice of the Peace in 1815. In 1816, he worked to get the Ridge Road designated as “The Post Road” by NYS, and served as the first postmaster of Gaines. Babbitt pushed hard to get the Town of Gaines to be set apart from Ridgeway and recommended its naming after War of 1812 hero General Edmund Pendleton Gaines. Today Gaines contains most of Carlton and Barre. In 1831, Babbitt became the Town of Gaines Supervisor and then served the district in the NYS Assembly. The enduring legacy of William Babbitt is perhaps best remembered with the 1849 building of the Gaines District #5 Cobblestone Schoolhouse, which he superintended. Mr. Babbitt purchased the bell for the school at a cost of $20. The gift of the bell served the community well until the closing of the school in 1952. Over the years, the supporting structure for the bell gave way and the bell dropped down making it unusable. In response, the Orleans County Historical Association offered financial help and Gaines Historian Al Capurso spearheaded the efforts to have the bell tower structure restored. With their help, the once familiar sound of the clanging of the schoolhouse bell will once again greet museum visitors. The rededication ceremony will take place the schoolhouse at 11am on Saturday, August 19. This is a free public event. The parcel of land on which the cobblestone schoolhouse sits was purchased by John Proctor in 1847 for $50. Under the supervision of William Jenks Babbitt, the building was completed in 1849. Constructed in the Greek Revival style, the District No. 5 Schoolhouse is a wood-framed structure with a lake-washed stone veneer. The walls are approximately 10″ thick, which is roughly 8″ to 14″ thinner than most cobblestone buildings. An elaborate cupola holds the school’s bell, which was donated by William Babbit after construction was finished. On the front, stones are set at four courses per quoin, while the sides and rear of the building are set with three courses per quoin. A sandstone water table sits atop the foundation, and the lintels, sills, and quoins are all cut from local sandstone. A portion of the northwest corner of the schoolhouse was repaired using bricks. Visitors will notice the presence of two doors on the front of the building; atypical of most one-room schoolhouses. Through each door was a separate cloakroom, the west door for boys, and the east door for girls. Later, pupils entered through one door and the right cloakroom was converted into a teacher’s office and library. The building was once heated by a central stove, but was later replaced by a basement furnace. The cobblestone schoolhouse served District No. 5 for 103 years before it was closed in 1952 after the centralization of Albion’s school district. In 1961, it was sold to the Cobblestone Society Museum for $129. Volunteers re-shingled the roof, repainted the exterior woodwork, built additional desks to duplicate original pieces within the building, and worked to furnish the schoolhouse with period items. In 2004, the belfry was restored to its pre-1930s design. 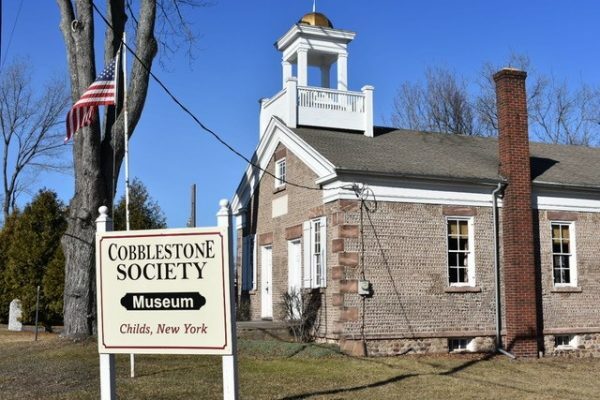 The schoolhouse is the museum’s “youngest” cobblestone building, and is believed to be one of only two cobblestone buildings to utilize a cobblestone veneer over a wood frame.